Despite the incredible development of smart phones and tablets, there are still 60% percent gamers in America game on PC. Dozens of new games releasing every year require elevated system resources for an uninterrupted gaming experience. There is one common thing that is on every gamer’s mind: How do I optimize my PC for gaming? Of course we know, buying the most cutting-edged CPU, GPU and SSD(solid state drive) will definitely improve the gaming experience. The thing is not all of us gamers can afford to spend such a fortune on them. In this article, I will show you tips and tricks to improve the gaming performance while spending no money or just very little money. If you have read similar articles, some may suggest you increase the virtual memory. I would not recommend doing so. Because loading data from the hard disk is slower than loading from RAM. So I strongly recommend adding more RAM instead of increasing the virtual memory. With more memory, you can load game data more easily, without the need to access your disk drive. If you’re an active gamer, you should consider upgrading your PC or notebook to 8 GB or more. You can refer to my other article on how to choose the right RAM to upgrade for better performance( http://forum.wisecleaner.com/index.php?/topic/7443-how-to-choose-the-right-ram-to-upgrade-ram-of-windows-pc/ ). But if you don’t have enough RAM and really need more virtual memory, you can increase Virtual Memory to assimilate a larger size of data making more room for the memory to facilitate the running game. 1. Go to Control Panel, view it in icons, and click ’System’. It is directed to restart your computer in order to take effect of the changes you have made. 2. Optimize the startup items. When you start Windows, there are many applications and services that run automatically. Overall performance can be noticeably improved by stopping all of the unnecessary programs that bog down your PC and by running Windows without any third-party services. To optimize the startup items, download Wise Care 365, and click ‘System Tuneup’ in System Tuneup section. There you can disable all the apps and services according to your own needs. If you’re an avid PC gamer, you may own an Nvidia or an AMD graphics card. Both manufacturers update and fine-tune their drivers on a monthly basis to help improve gaming performance. Or maybe you have a laptop that has only one intel integrated graphics card. Updating your driver to the most recent version should deliver a slight increase in performance every time, and potentially make the entire experience smoother. and download the Intel Driver Update Utility to update the driver. 4. Download the latest patches for your games. Like any piece of software, games are never completely finished upon release. After the games hit the shelves, the development teams are still fixing bugs and working to increase games performance. As such, users should get the latest patches available for them. 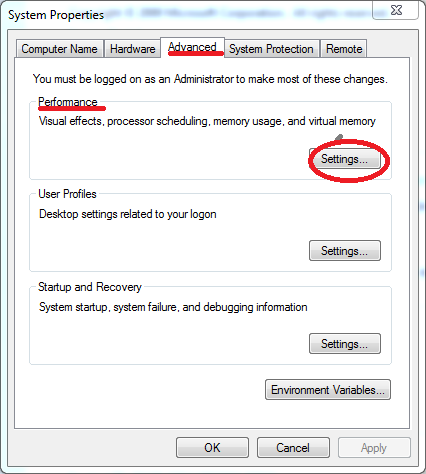 Depending on your resolution settings and your specific machine, you will gain a couple of frames per second. This can mean the difference between a choppy and smooth gaming experience. Hard Disk Drives continuously absorb new data. Frequent addition of new information and deletion of the old one causes the data to form clutters. It is then hard for system to track down the scattered game files, resulting in lags and pauses. To rearrange these fragmented files and data, open Wise Care 365, check all the partitions in your computer and defragment all of them. Please not that if you are having SSD drive in your machine, it does not need to be defragmented, as it does not engage any fragments of information. Windows Registry is a set of information that contains specific instructions for applications, drivers, and services. System refers to the relevant information in registry, whenever an activity is performed. Such continuous use of registry makes it corrupted by assimilating errors. To attain an enhanced experience of gaming, you need to fix registry errors using a reliable registry cleaning software like Wise Registry Cleaner. Windows keeps getting slower and slower with each program you install on your PC or laptop – and that has a direct effect on all of your games! The reason for this is that a lot of programs run some sort of background activity, even when they’re not being used. Download Wise Program Uninstaller and uninstall the programs you do not need. The good thing about this uninstaller is it clears all the residual items left behind after the built-in uninstaller finished its job. Make sure you still have some space left on your hard drive. Not only does this give you little breathing room, your computer will also run slower because of it. Admit it, in most cases you don’t need half of what’s stored on your hard drive right now. So get rid of it. If you are playing, you are definitely not doing anything else. All the active process, services and applications running in the background, either visible or not, are consuming your memory and other system resources to some extent. It is obvious that a game application requires adequate MBs of free memory to perform simultaneous actions easily. To provide this free memory, it is submitted to close down each running application (except the game) to free up the memory. Instead of closing the programs and services one by one in the Task Manager, you can download Wise Game Booster to close them all by one click, better yet, it also optimizes relevant system settings for better gaming experience. You can also Disable all animations and 3D effects for better performance. Windows XP, Windows Vista and Windows 7 & 8 offer animations for minimizing and maximizing windows and fading menus. However, if you’re a gamer, this can interfere with your experience, so you should turn them off. 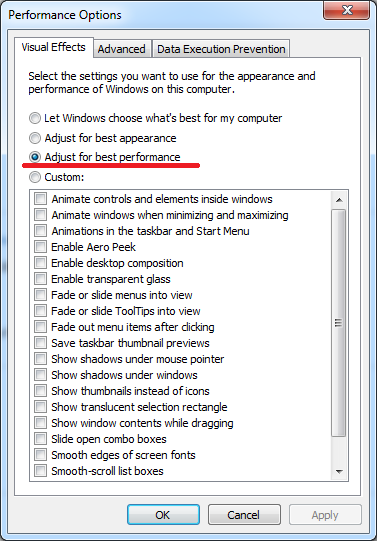 Right-click on “Computer,” and select “Properties.” You’ll find all of the animations settings under “Advanced\Performance\Settings.” Just choose 'Adjust for best performance'.